Pontian Wanton Noodles House @United Square (Singapore) | Get Your Grub On! Wanton Mee: Local Fastfood No.1! I had a lot of things to do for my trip today so I needed a quick dinner fix urgently. I was running some errands over at United Square in Novena and on my way out I passed one of the ‘Pontian Wanton Noodles House’ branches. Traditionally I have these noodles late at night and quite frequently in their 24h branch at Cuppage Plaza but it seemed like a good choice and a break from all the burgers recently. As I was in a hurry and did takeaway I only realized at home that it didn’t come with the usual ‘Dumpling Soup‘ and worse, I forgot to ask them to use the really spicy chili, my bad. A big plus tough was that my takout box was loaded with extra pickled chilis which I found brilliant as they gave the rest of the ingredients a nice sour and spicy sidekick. The char siew was lean and good but not to intensely sweet and bbq-y. The wantons weren’t too thrilling either but their crunchiness nicely added another layer of texture to the whole thing. 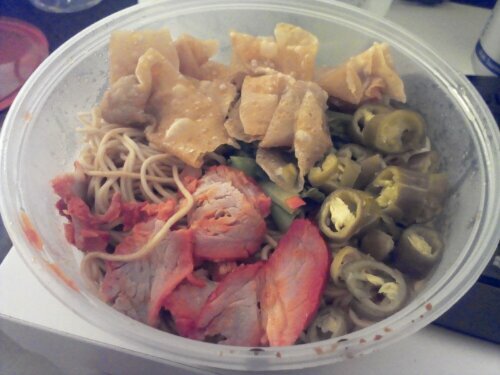 I wished I wouldn’t have forgotten to ask for the extra hot chili sauce but it was still good and spicy enough to start up a light sweat and the one thing I liked the most was the hardness of the noodles, nice bite. The ‘Wanton Mee‘ was nothing too exciting or deluxe but still filled me up just nice and with it’s unremarkable looks, diverse textures and flavors it left me more satisfied than most other fastfoods would have.